Without me along, who will heal you when you're hurt?" Over the years, there's been a considerable amount of merchandise availble for the game. Here's a list of everything you can hope to find! 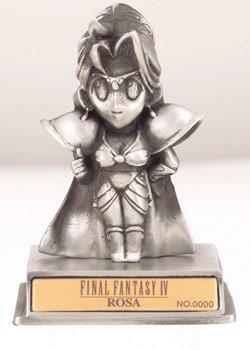 Squaresoft released several cold cast statues depicting memorable scenes from Final Fantasy IV - VI. There were also ones made for other games in the series including Aerith's *spoiler* scene in FFVII and the ballroom scene from FFVIII. At any rate, the cold cast statues from IV - VI include Cecil on Mount Ordeals as he becomes a Paladin, Bartz and Boko relaxing by a tree, and Celes during the Opera scene! These were made by Kotobukiya. Each figure is 4" tall in this series and includes a card with the serial number. 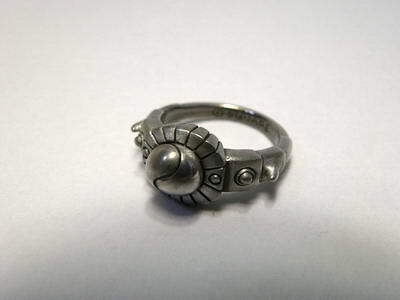 These are very rare finds and worth the money if you can afford them! 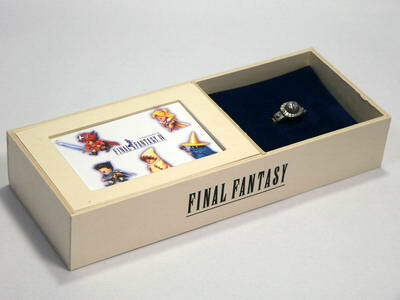 This set includes a pewter "Orb Ring", and a FFIV phonecard that depects several of the characters in SD form. 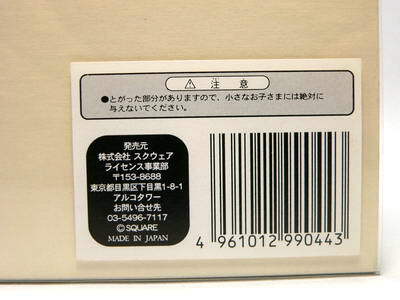 It comes packaged in a very nice box with a sticker that reads © Square, along with other things in Japanese. These were made in limited edition and are a rare find. Additionally, there were several phone cards produced. Each of which can go for pretty hefty prices on Ebay. You can tell when one is authentic due to the older Square logo or any dates that you can find on it. But due to the amount of bootlegging and unofficial merchandise floating around, it's hard to tell what's what. 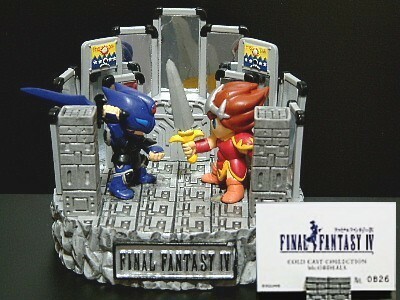 For the DS release of the game, SquareEnix produced these Trading Arts figures along with the various other ones that can be purchased. 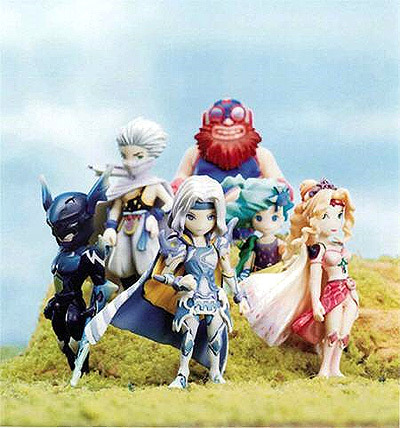 The figures included are Cecil, Rosa, young Rydia, Edge, and Cid. Each figure stands about 6cm tall. You can buy them individually on Ebay, or it's possible to find some at Anime convention dealer's rooms (if they still have boxes of them). Ebay however, is probably your best bet right now. If you manage to find a case of them (retail is $39.99 USD, but probably higher now), you will get one full set and three duplicates. I personally have Rosa, Edge and Cid in my collection. They are very high quality and detailed considering that they are chibis. This book was published in Japan in 1991 by Square. It contains information such as maps, strategies, and artwork for the game. It contains 184 pages and comes in soft-cover. This book was published in Japan by Doremi Gakufu Shuppan Sha in 1991. It is 104 pages long and contains sheet music for all of the songs in the game. It comes in soft cover. 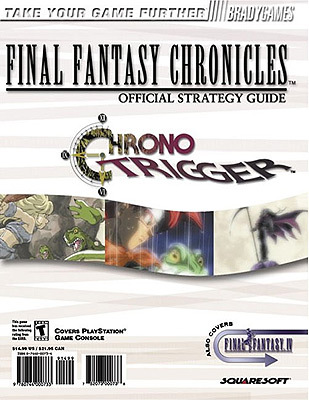 This strategy guide was published in 2001 by Bradygames. It contains 160 pages and information on Chrono Trigger and Final Fantasy IV. 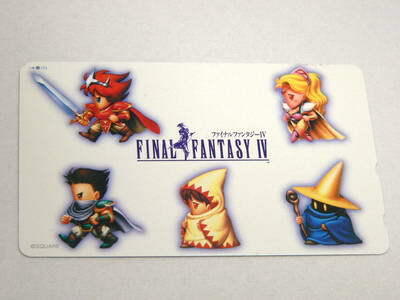 The FINAL FANTASY IV section covers character classes, bestiaries, and locations of key items. It seems to be a very good guide. However, the levels that the characters attain their spells is not listed, and some of the maps are not there or completely wrong. Overall, it seems to be very useful if you like to use strategy guides!